The holidays are coming up and your human family members aren’t the only ones you have to shop for! 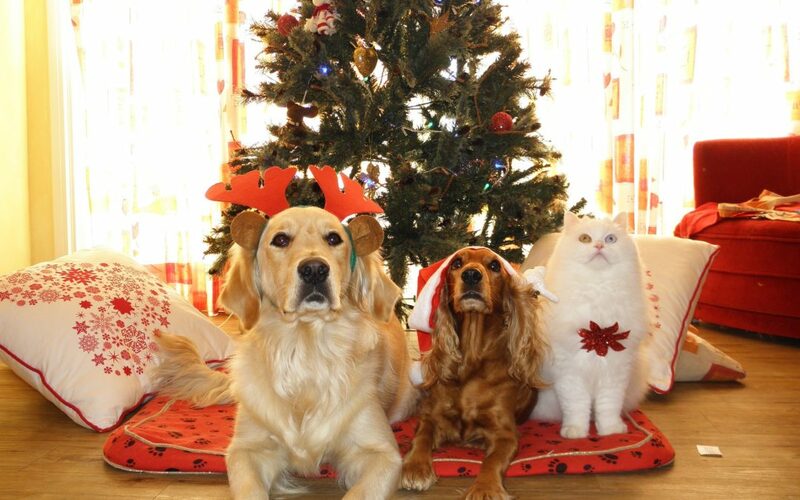 Your pets are part of your family and including them in the celebration will brighten everyone’s holiday in the best way. Don’t know what to get your cat or dog? We’ve compiled a few of our favorite items to give you some great gift ideas! A puzzle bowl for their food – Not only does it keep them from eating too fast, it’s a great way to challenge your dog’s smarts! They also make some awesome puzzle toys for treats that can provide the same effect. Christmas Themed Dog Treats – Cookies aren’t only for Santa during the holidays! Fun and festive treats for your pups are sure to be a hit. Personalized Dog Sweater/Clothes – My mom’s dog loves to dress up, and if your dog does too then this gift is perfect. Cute, stylish, and personalized with their initial! K9 Cannon K2 Ball Launcher – this toy is perfect for long games of fetch with that super active dog that never seems to run out of energy. Play all day long and give your arm a rest! Orthopedic dog bed – This comfy dog bed may or may not turn your pup into a serious couch potato! These beds are perfect for dogs with medical problems and arthritis, too! Triangle shaped plush cat tunnel/bed – This fun and cute little bed will be your cats favorite snuggling spot, second only to your lap of course. They come in a variety of different colors and designs, so you can find the perfect one for your home! A Cat stroller – Is your cat constantly trying to get outside and roam free? Now you can satisfy their urge with this cat stroller. It’s got an enclosed, breathable seating area so that your cat can take in the sights and sounds safely. Cat nip bubbles – These fun catnip bubbles are sure to provide endless entertainment for you and your kitty! A KitNipBox subscription – You’ve heard of barkbox before, right? Well now there’s a similar service for your cat! Subscriptions range from $19.99-$29.99 a month and also come in a variety for multi-cat homes! Each box includes fun cat toys, treats, accessories, health and hygiene products, new gadgets, and some surprise items! Ice Cream Truck for Cats – We all know that cats love to get in boxes, and this box is one they’ll want to be in all the time! This cardboard ice cream truck will make your cat the cutest little ice cream man or woman on the block!